Ovenden WR v Campion. Damon Randall. 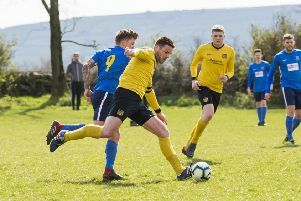 Ovenden West Riding and Campion fought out a 1-1 draw at Natty Lane in the West Riding CA’s Premier Division on Saturday. West Riding got off to an excellent start when George Bamford was bundled off the ball by Dan Brown in the 10th minute. From the resultant free kick, Damian Randall’s 25 yard strike was too much for Ivan Willis in the visitors goal, The hosts lost Tom Hiley with a nasty ankle injury minutes later and were pegged back by the Campion equaliser from Jordan Missin, who finished off a sweeping move involving Steve Bargh and Adam Jarrett. Campion piled on the pressure for the remainder of the half but Graham Hall and Mat Devlin, supported by ‘keeper Chris Moroney, kept them at bay. In the second half West Riding had the majority of the play and put Campion’s rear guard under pressure. Steve Fullard, George Bamford and Randall all went close. Halifax Irish’s 100 per cent start was ended by a 6-4 defeat away to Lepton Highlanders. Eli Hay scored a hat-trick for the visitors and substitute Hayden Kerris got the other for an Irish side who trailed 3-2 at the break. Ovenden and Irish face teams still looking for a first point of the season on Wednesday. West Riding are at home to Dudley Hill Rangers and Irish travel to Hunsworth.